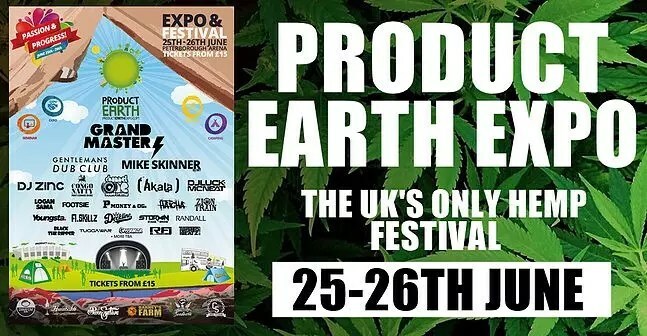 Going to Product Earth 2016 has shown us the potential of the UK Cannabis community to come together and celebrate the benefits of cannabis. The cannabis expo/festival itself is the result of the hard work of just 6 people (3 internal organisers, 3 external organisers), plus the events staff needed to put everything together. With such low resources, you’d expect some serious limitations, but we found Product Earth was a well-planned and rewarding weekend that gave valuable insight into the UK’s Cannabis Industry. Looking across to the US it is easy to spot the amazing opportunities in the so-called “Green Rush” and I have great respect for those putting themselves out there in UK Cannabusiness, helping to pave the way for a legitimate green industry over here. It is still very much a grey market, and it takes a lot of balls to start a cannabis-focused company in an arbitrary land that still criminalises users. That being said, you can see businesses popping up in all areas specialising not only in seeds and smoking supplies but also in extraction ovens, BHO extraction kits, pre-drug-test clensing mouth-wash and all manner of cannabis technology. These people are smart as they see the potential as Cannabis continues to boom worldwide. Product Earth was set-up to showcase the cannabis industry in all its wonderful forms. The attendance at Product Earth was a mixture of cannabis industry professionals, cannabis social clubs, medical users and regular folks just there to enjoy a joint or two. Speaking to some of the exhibitors, this year was bigger than 2015, and we hope that next year we can help spread the word and get even more people down there to celebrate cannabis and its benefits. The atmosphere of the whole festival was remarkably relaxed, especially towards smoking and dabbing. Police presence was not required, and I didn’t see any serious drama/trouble all weekend, as people came together to get high and enjoy cannabis. It is easy to see why the atmosphere of Product Earth was relaxed compared to other festivals – in part at least it was because of a distinct lack of drinking and Class A drugs among the majority of the festival-goers, who chose to get high instead. There was a Bar on-site, but again, many people at the festival opted not to drink. 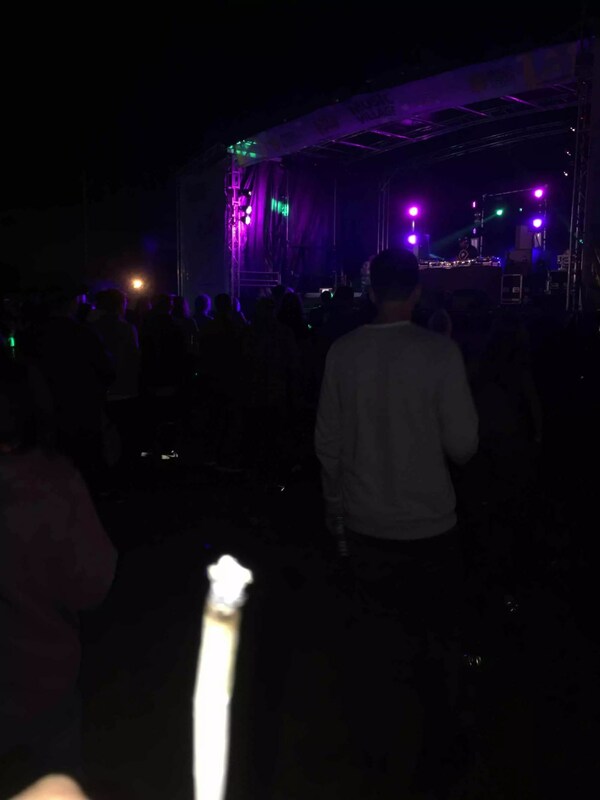 Smoking was seemingly permitted anywhere outside, and the festival goers quickly realised that it was OK to spark one up, which is in my opinion how it should be across the country. We spoke to security (an external security company hired to watch over the festival) about their views on cannabis and reaction to the festival, and they said it was one of the nicest gigs they’ve had – no trouble or violence, and they don’t have to be knobs to people who are smoking joints – again, the way it should be. 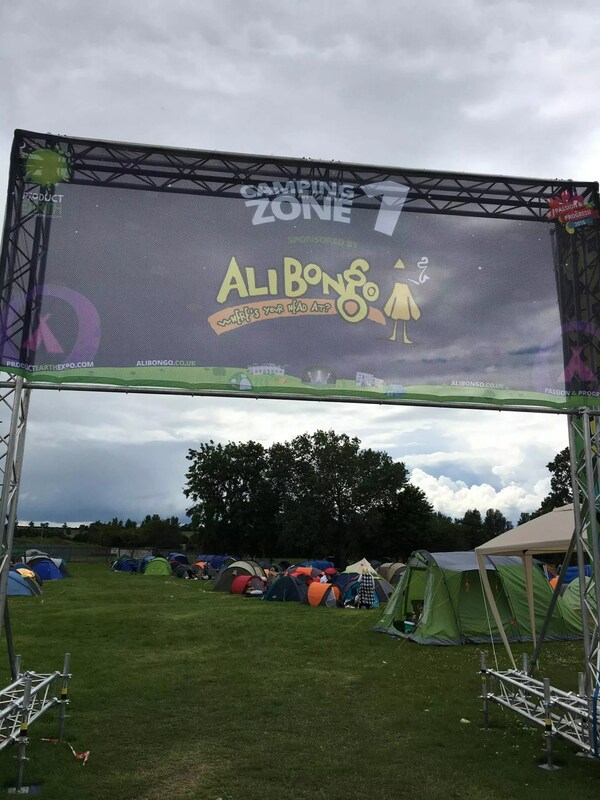 We were staying in campground 1, (all campgrounds were basically part of the same field cut into four portions), which was sponsored by our advertising partner Ali Bongo. They were handing out goodie bags filled with T-Shirts, grinders, rizla and even cannabis seeds! 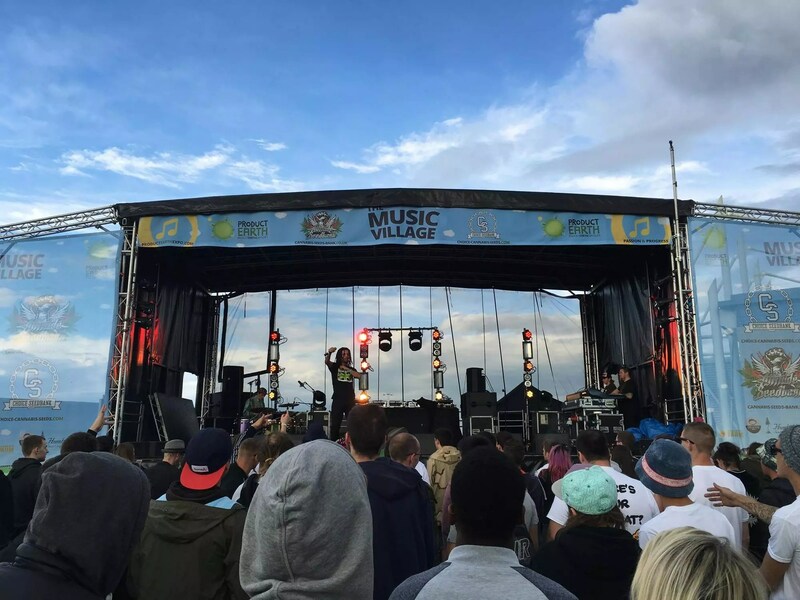 The Music was great, and the festival showcased a number of artists I knew such as Akala, Congo Natty & Congo Dubz and Mike Skinner. The stage was set up outside the Expo, and the view from the front was great – almost looked like the intro to the Simpsons with the clouds behind the main stage! There were different focuses on Friday, Saturday and Sunday, with the first day being more jungle and dnb, the second more grime and the third day more reggae/dub. The Expo itself was fantastic – the first time I went in there I thought it was comparable to some sort of Disney World for Stoners. Inside Peterborough Arena, there was pretty much everybody who’s anybody in the cannabis industry, and most were showcasing their cannabis-influenced companies and products. I saw stalls covering smoking supplies, cannabis seeds, vape products, t-shirts, snapbacks, hemp products, smoking tips and lots more, dotted about the exhibition hall. I made sure I introduced myself to as many people as possible throughout the weekend as networking is such an important part of what I do. We met some great like-minded people. 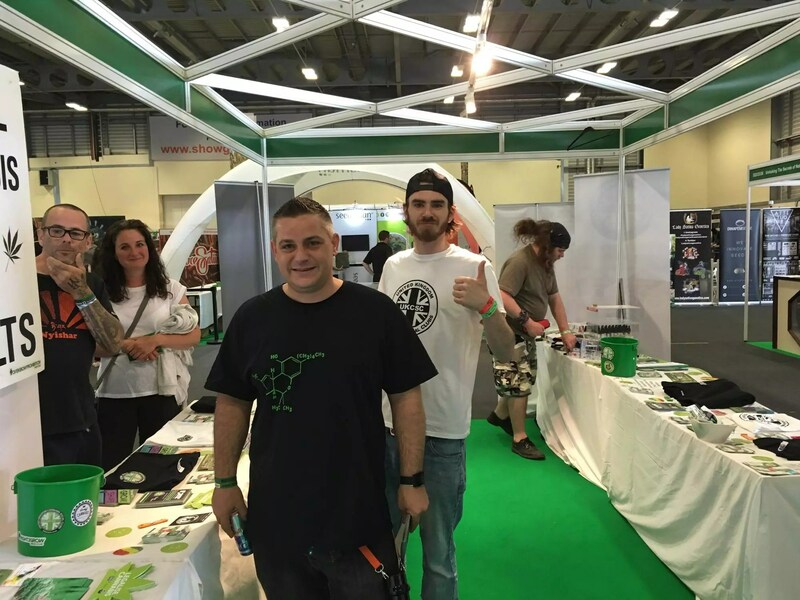 We spent a bit of time with the United Kingdom Cannabis Social Clubs guys and caught up with their President Greg De Hoedt to talk about future events and Green Pride in Brighton next Saturday. There were also several seminars throughout the weekend, but we only managed to catch one by Clark French about medicinal cannabis and the United Patience Alliance. 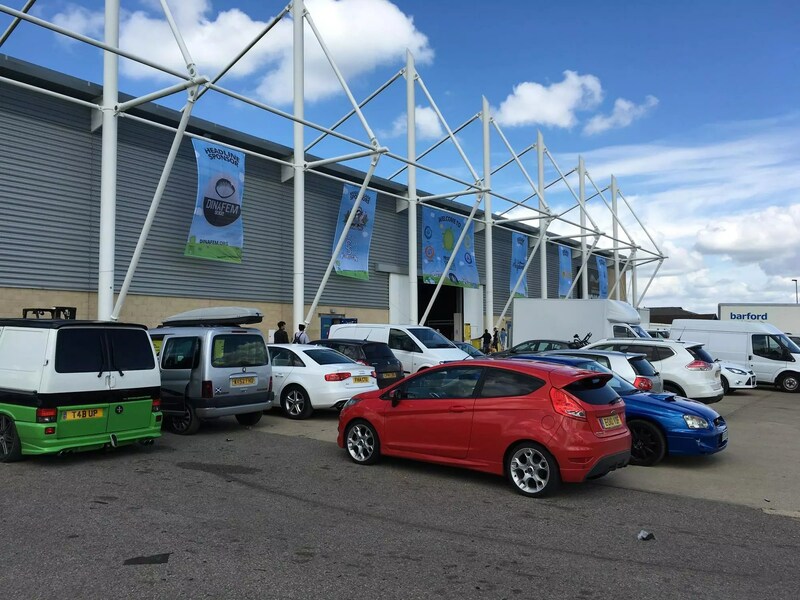 Product Earth 2016 was a small event, and possibly the smallest festival that we have been to here in the UK. We hope that it continues to grow. There are some areas they could improve on next year, particularly in the food department. On offer this year were three food stalls, which weren’t really enough options for those staying from Friday-Monday on the camping ground. That being said, for the number of organisers and the number of people at the event over the weekend, I think it was well-organised, and there were no points over the weekend that I found myself wishing I was back home – in fact, I could have stayed there another week! We hope that next year we can help spread the word and get even more people down there to celebrate cannabis. I got a lot of free stuff and purchased a new travel box and some other bits over the weekend, and somehow I think I’ll be ok for rizla for the next month or two!